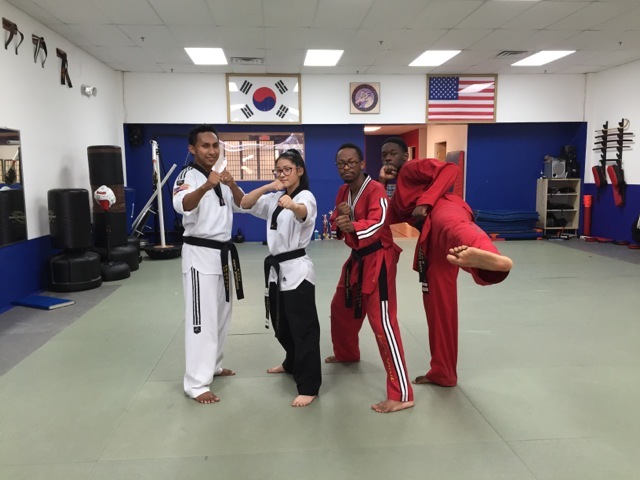 Tae Kwon Do classes are available for students of all ages. Students learn the Kukkiwon style of Tae Kwon Do with a curriculum that teaches forms, kicking combinations, sparring and board breaking. 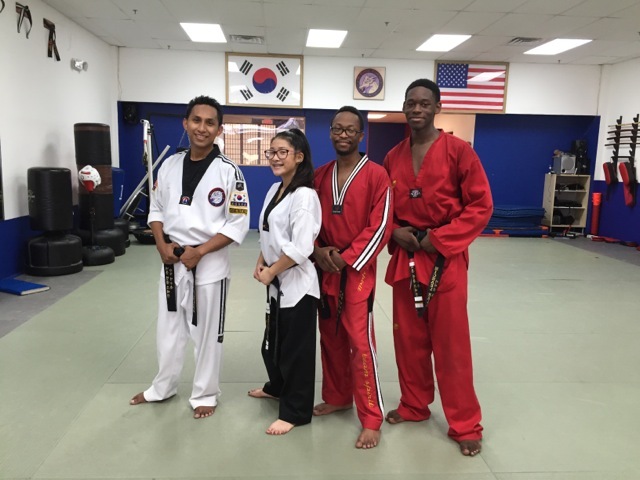 In order to help students stay motivated and measure their progress, we implemented a Stripe System for the Tae Kwon Do program. For each belt, students must earn four stripes (described below). Once a student earns all four stripes at each belt, he or she is ready to take the test to proceed to the next level. Red Stripe: Obtaining a red stripe indicates knowledge of a kicking combination to receive the next belt in our belt ranking system. It is important to master each set of kicks so the body can be prepared for the more complex kicks. Blue Stripe: Obtaining a blue stripe indicates knowledge of form to receive the next belt in our belt ranking system. Tae Kwon Do forms are the pre-arranged sequence of offensive and defensive movements, and each rank requires learning of a new form. They become progressively more complex as one advances through the ranks. Yellow Stripe: Obtaining a yellow stripe indicates knowledge of a breaking technique to receive the next belt in our belt ranking system. One must practice precision and control to accomplish the board break. White Stripe: Obtaining a white stripe indicates a student's discipline in two areas (1) work/chores at home and (2) schoolwork. We will provide a checklist for the parent to assist in monitoring a child's accomplishments. This checklist requires signatures from both the parent and the grade school teacher. The stripe method provides Master Yun with insight that a student has the knowledge to pass the test and receive the next belt rank. The belt ranking system provides a sense of self-fulfillment, pride, and encouragement to challenge the student to be and do the best of his or her capability. The Little Dragon program is designed for children six years old and younger. The Little Dragon curriculum divides the white belt to four parts: white, yellow stripe, green stripe, and finally blue stripe. 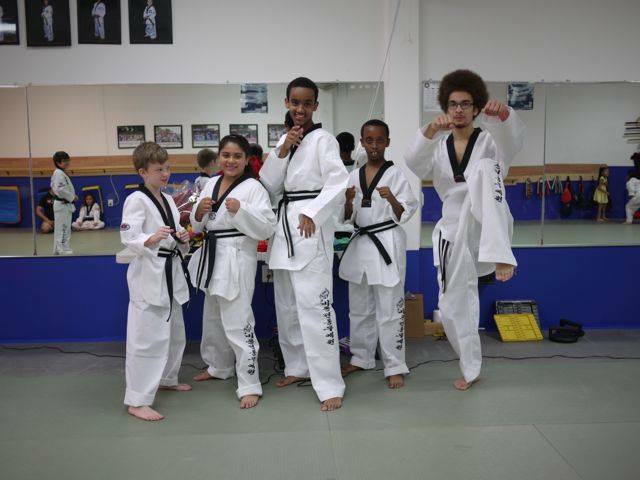 This extended program allows the student to have a better understanding and training in the basics of Tae Kwon Do. When Master Yun isn't teaching, Paul, Hanna, Trulynd and Michael teach the classes. The fabulous four. 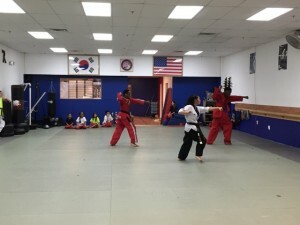 Each has a unique style of teaching, as well as favorite techniques. If you're taking a class with Trulynd, expect burpees! Don’t judge yourself by what others do. Try to be better today than you were yesterday.